Despite the high rise, I’m sure you can see the attraction? 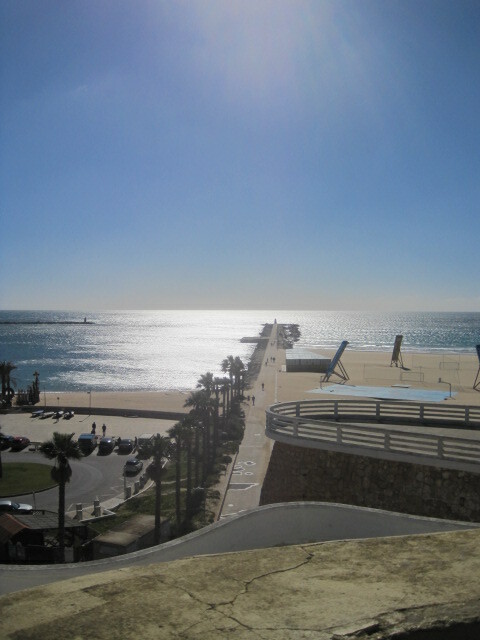 Praia da Rocha was the Algarve’s earliest resort, and it still makes a pleasant place for a winter stroll. I don’t have much time to create a walk post, having just arrived home, so I’ll be starting you off very gently. 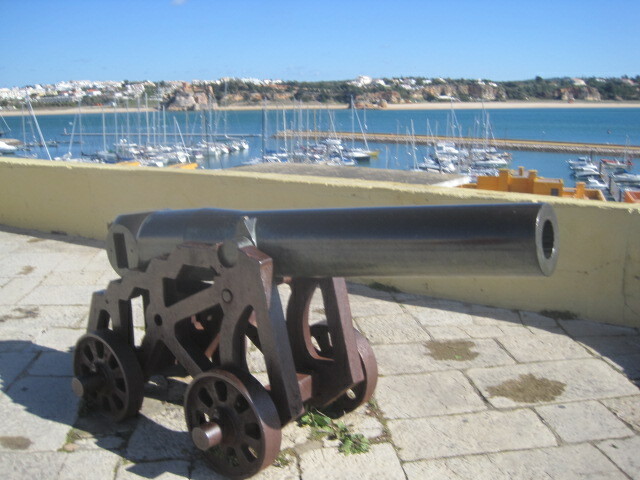 Praia da Rocha and the city of Portimão meld into one where the River Arade empties into the Atlantic Ocean, on Portugal’s southern coast. Next week we can wander the river bank at leisure, but let’s start simply, with the beach, shall we? In contrast, the remains of the 17th century Fortress of Santa Catarina de Ribamar come as something of a surprise. Testimony to the days when pirate corsairs raided these shores. And isn’t that the most inviting causeway stretching out into the sea? I think I can spy a lighthouse at the end. Zip your jacket up! 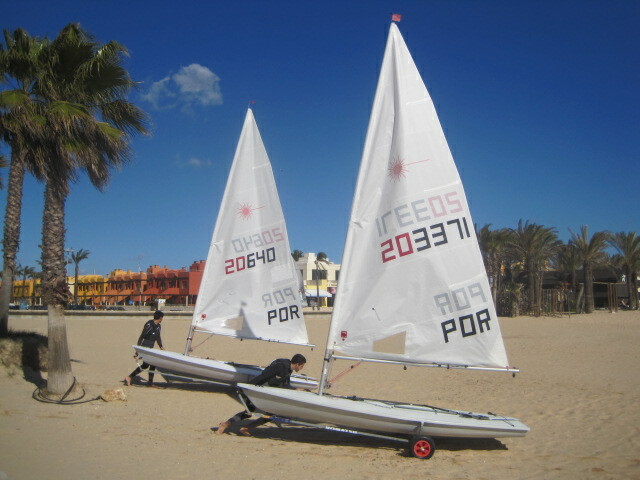 A windsurfer or two is testing the breeze. I bet those waves are cool! Collar huddled against that bracing wind, it’s a brisk stride back to the shelter of the cliffs. You can feel yourself relax then, as the warmth tickles your shoulder blades. 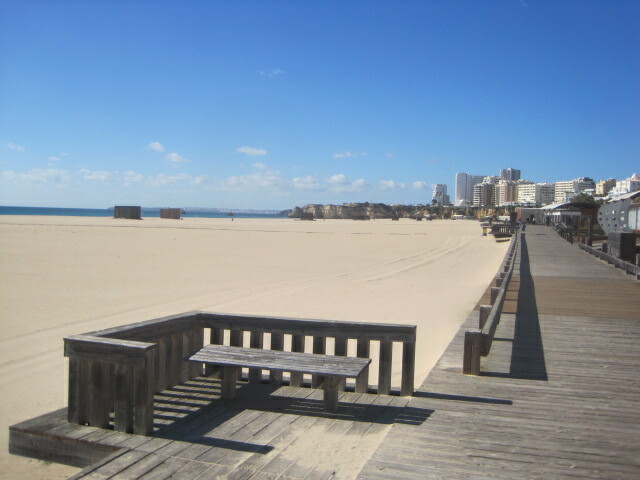 But it’s the boardwalk that beckons, and those mysterious stacks at the end of the beach. You can walk back along the beach, admiring the cliff face in detail, or return to the cliff top. There are several sets of steps. 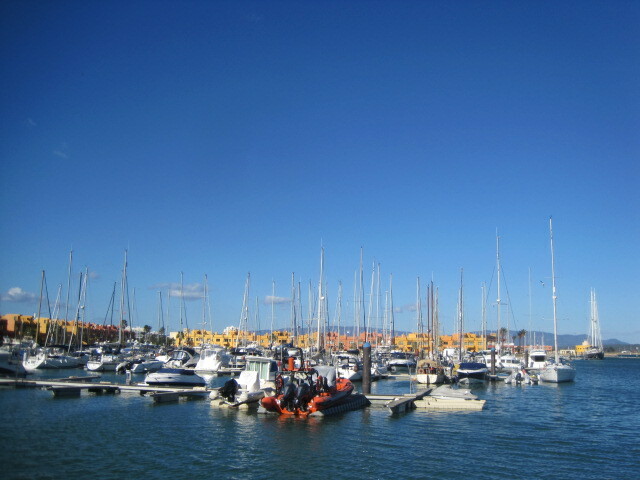 Most of the available parking is around the marina, at the east end of the resort. Let’s just pop our noses in there first, then go looking for something to eat. If you’re not too hungry, you can wander out around the marina. There are plenty of restaurants to choose from, even though many close in the winter. I’m moving on to Portimão, and I hope you’ll join me there, next Monday. I had a wonderful two weeks ‘away from it all’, and I have so many of you to catch up with! Thank you for your patience. I’ll stop by as soon as I can. Meantime, there are some wonderful walks to share. Some of you have been very diligent. For anyone new to my walks, the logo or my Monday walks page will give you more details. Goodness- I’m on to my second cuppa already! Paula has been checking out ‘restless fliers’ in Zagreb. No, nothing to do with me! Welcome to Anabel, who introduces us to a beautiful light show in Glasgow Botanic Gardens. Jude- you’ll like this! And you can rely on Elena for quirky! Who wouldn’t want to eat with Yvette, and share music with Frizz? What a combination! The Eternal Traveler has joined us this week with some stunning views of Japan. I’m so jealous! That’s it for this week, folks. I didn’t think I’d make it! Thank you for all your brilliant contributions, and I can’t wait to see what next week brings. Have a good one! Beach strolls are the best Jo – I love the tranquility of soft blue and pale sand colours in your photos. Welcome back Jo! Algarve seems a great place to take rest, with that beautiful empty beach and clear sky 🙂 I come from a seaside city so I always love walking along the sea, thanks for the walk! Thanks, Colibrist 🙂 You’re never too late for a Monday walk really. I just fit you in on the following week, whatever day you send me your walk. If they all come in on a Monday I’m always short of time because I’m usually out walking. Many thanks for joining me again 🙂 You too! I love an empty beach, Rosemay, and if it’s because temperatures aren’t very high I really don’t mind, if the sun’s in the sky. 🙂 Many thanks for your walk! I’ll be along there soon. It’s weird seeing the beaches so empty, but certainly makes for stunning photos! Reminds me- I should be on Seaton beach with the Nordic walkers this morning, Pauline, but looking at the grey sky I might give it a miss 😦 I’ll come to the beach with you, instead 🙂 Many thanks, love! 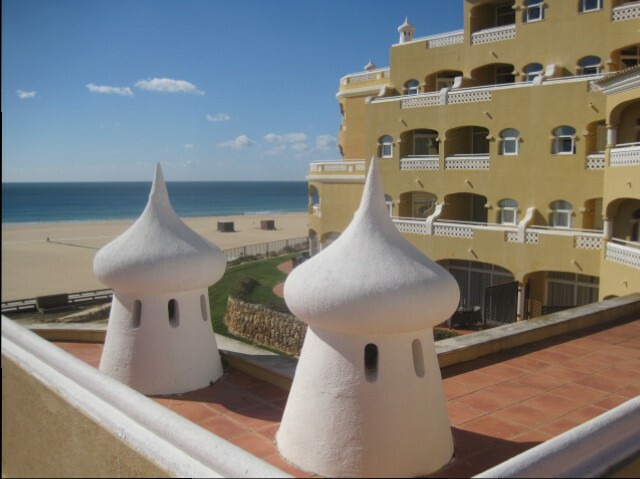 I would like to order one giant heap of winter in the Algarve, please! Enjoy your sunny bit of heaven…. I was thinking that I hadn’t seen anything from you lately and then I discover that a number of my follows have disappeared! A WordPress bug I expect. I liked it but not as much as Wroclaw or Krakow. Because of recent history I think it is a place to have been to just to have been (if that makes sense) there rather than expect to see too much ? There was a TKMAX so yes, she was! Sounds and looks divine, thank you for sharing it with us. Oh, lovely! I love beaches in the winter. Missed you while you were gone! You and me (oh, and don’t forget Jeff and Rocky 🙂 ) lazing on a blanket (maybe two?) with a big heap of books. Sound good? I might manage wine, too 🙂 🙂 What a temptress! Not flat calm, LolaWi, but lovely with the blue skies 🙂 Thank you! 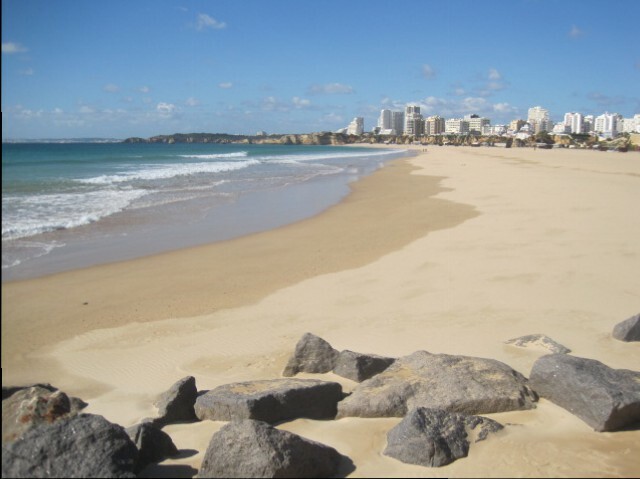 I love your photo’s of the deserted beach!! Thanks, Madhu 🙂 I was thinking about what to post on the flight home (how’s that for dedication 🙂 ) and this was the simplest I could think of (out of the 1040 photos I took- all getting a little out of hand?) But don’t you just love it? The sharing, I mean? I always regretted not getting to Portugal while I lived in London, and now I’m wondering why on earth I didn’t go to this beautiful place in the winter! It looks stunning. 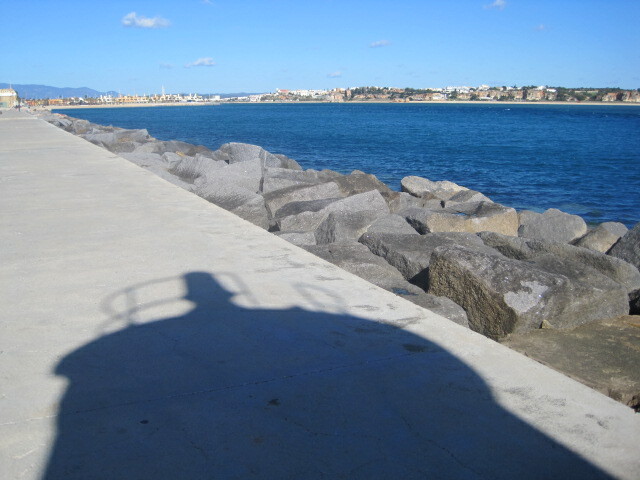 I have another walk to offer you, actually not all that far from Portugal (compared to Australia, that is! ): walking in the mountains above Interlaken, Switzerland. Switzerland is one of my regrets, Elizabeth. I touched briefly on Lugano one year in the Italian Lakes (oh, how I loved those! It seems a lifetime away 🙂 ) and I’ve seen a little of Austria but there’s so much still to see. That’s the story of my life, I’m afraid. 🙂 Many thanks for sharing.